So, today's LTPT may be a little morbid, but this is a question that I wonder about. I know the answer for me, but I'm always curious to know what the answer is for others. What would you like your funeral to be like? Do you want it to be a party? Do you want people to be hysterically sobbing over the loss of you? Do you want a traditional funeral and then a rousing party (or wake, I guess) afterward? And this may be outside the realm of funeral, but where do you want to be buried? Do you even care? Anyone who read this blog back in January knows what I want. It hasn't changed. I still want to put the fun in funeral. 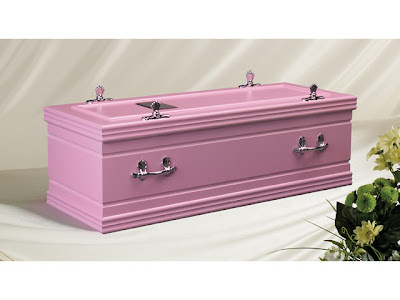 I want a pink casket. I want dirty jokes. I want a guest appearance by Kathy Griffin. I want pizza and ice cream sundaes. And I want a couple of bouncy houses--one for the kids, one for the adults. And you know what else I want? A roast. (Like a celebrity roast--not a hunk of meat). Everybody can take a turn getting up to talk smack about me. Oh, and karaoke. Please have karaoke. Drunken karaoke, preferably. Of course I want people to be sad that I'm gone. I'm egotistical like that. But more than that I want you all to celebrate my life in the way that I like to have fun. Oh, and be sure to bury me in some really slutty looking fishnets.